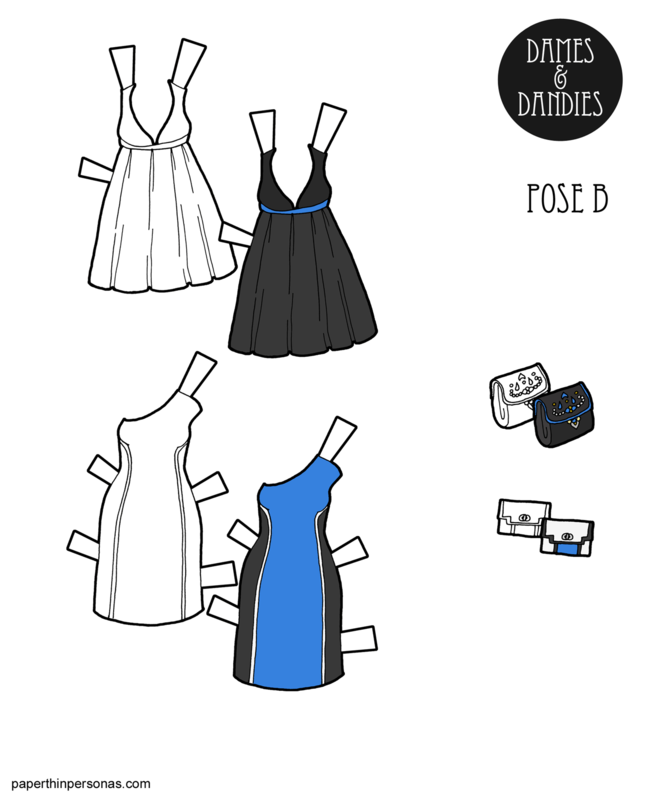 If there’s one thing rounding up all the B Pose paper dolls a few weeks ago made me realize, it was that I hadn’t done any short party dresses for them. That seemed like a omission worth rectifying. So, today I have some cocktail dresses for the B pose Dames. After all, the holidays are coming and maybe there’s a party they need to attend. I tend to make two dresses when I do these sets, because I feel like one dress “isn’t enough”, but I’ve also been thinking about trying to go back to a daily update schedule in which case, think one dress would have to be enough. I haven’t decided yet what makes the most sense. I miss updating daily, but I’m also nervous if I could keep up to it. The black and blue color scheme was inspired by what I’ve been seeing in the department stores this season. But if you want a more autumnal or summery color combination, hop over to the Patreon page where there’s a second color scheme you can download and print. It’s open to everyone, not just Patrons, but while you’re there I would ask that you consider helping out and giving a little each month to support the blog. And, as always, I love to hear whatever you’d like to tell me in the comment. This whole week of 1940s fashion would not have happened if it weren’t for the suit on the left from LACMA. Seriously, I feel in love with that suit and then I was like, Welp, I guess I’m going to draw a paper doll with 1940s underwear and things… they spiraled from there. You can see the suit in photos here and it was designed by Gilbert Adrian. Who was Gilbert Adrian? Well, it was one of the names used by Adrian Adolph Greenberg, a costume designing legend of the Golden Age of Hollywood. Even if you’ve never heard the name Adrian, you have seen his work. He designed costumes for The Wizard of Oz,the 1938 Marie Antoinette and over 250 other films. During the 1940s, he began a commercial fashion line from which I assume this suit is related, based on the date. Now, the dress on the right shouldn’t be neglected, just because it’s not from a famous designer. It’s from the McCall sewing pattern company, McCall 6533 to be specific. I liked how contemporary it felt, despite being from the 1940s. I am regretting that I didn’t draw a matching hat to go with it. Clearly, I need to do more 1940s clothing to fix that act of neglect. The purse is a bit of a mystery to me. I noted the date 1940s next to it and usually I also write down the source, but I guess I didn’t. I’ve been through my 1940s Fashion Pinterest Board, where I try to keep these things, several times with no luck. I’m sure there was a source and I am going to leave things at that. I tried to capture the strong shoulder of the 1940s with both these pieces, though I’m not entirely sure I was successful. The 1940s is much like the 1980s in that the shoulders are broad. If you missed it, on Monday, there was a 1940s version of Beatrix. Friday there will be summery 1940s dresses to round out the set. 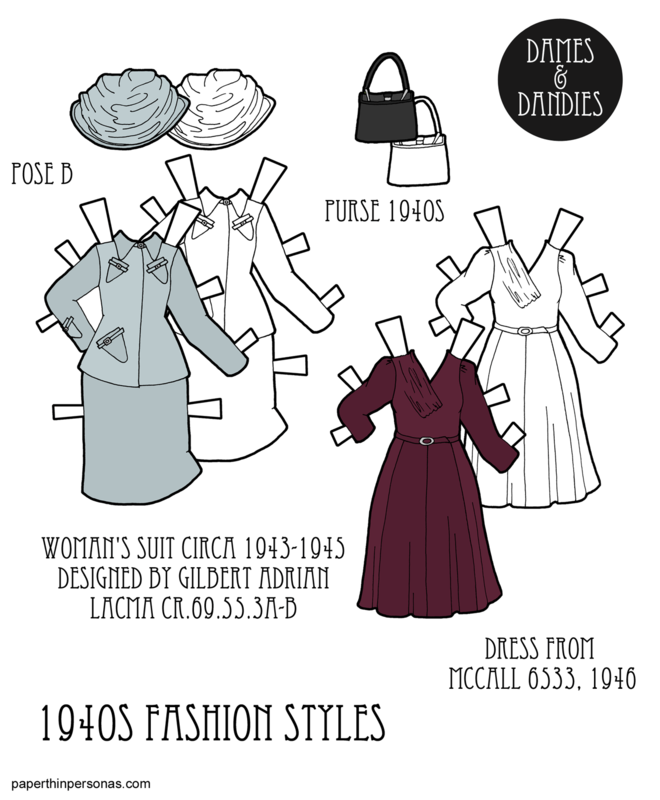 Meanwhile, let me know what you think about today’s 1940s dresses in a comment. I’d love to hear from you. Need a doll for today’s paper doll clothing? All the B Pose Dolls & Clothing, but I would recommend the 1940s Beatrix if you want period underwear to match the era of these dresses.